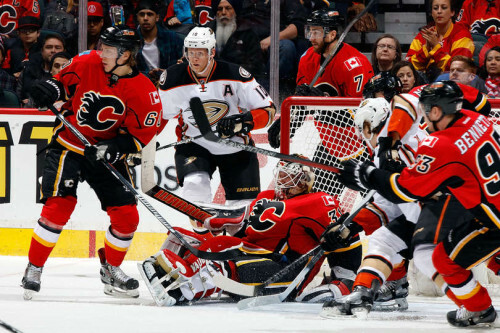 As the new year begins, those who follow the Flames closely would have likely predicted that the team’s 2016 resolution would be to perform better against divisional opponents. Following a 5-4 loss to the San Jose Sharks the Flames are 4-8-1 against the Pacific Divisional opponents. To make matters worse these defeats are starting to become a regular occurrence on home ice. The loss to the Sharks means the that Flames have now lost 4 of their last 5 games on home ice and all of the losses have come against divisional opponents (Anaheim Ducks, Los Angeles Kings, Arizona Coyotes, and San Jose Sharks). This lack of success on home ice is surprising as it comes after the team set a Flames franchise record of winning 11 straight on home ice. It was the Flames success on home ice coupled with a 7 game winning streak throughout November that has gotten the team back into the playoff picture. Currently, the Flames sit four points behind the Vancouver Canucks for third in the Pacific Division and five points behind the Nashville Predators for the last Wild Card spot. Indeed, the Flames are not out of it but having such a poor record against the division will make even a small deficit like four points difficult to overcome. The team’s struggles against divisional opponents are not lost on the players. Flames center Matt Stajan said, “One of the reasons we were successful last season is we won the divisional games. That’s why we made the playoffs. We don’t have a good record against your own division, and it makes it that much harder to get there. We have half a season here, but these are games we have to find ways to win, otherwise you’re not going to get to the playoffs, that’s just the way it is.” Fans should take comfort in the fact that the team’s recent losses against divisional opponents have been close games. No glaring mistakes or poor performances (other than special teams) have cost the team games. Essentially, the team needs some help with puck luck and over the course of the season this tends to even itself out – as long as effort is not being cheated. Going forward, the Flames do not see a steady diet of divisional opponents until February. Hopefully, a handful of games against the Eastern Conference’s lesser opponents can help the Flames get puck luck on their side again.